It is the real Paa. The Amitabh-Abhishek Bachchan starrer may be an emotional story of father and son against the backdrop of Progeria, but in real life, it is a tale of a family from Chhapra in Bihar. The accelerated ageing genetic disorder affects one in four lakh people, but five of Bisul Khan and Razia Khatoon’s seven children have it. Their three elder daughters - Guriya, Rehana and Rubina - died at 17, 24 and 13 respectively. Two sons - Ikramul (23) and Ali Hosain (22) - are alive but their medical age is 70 and 66. 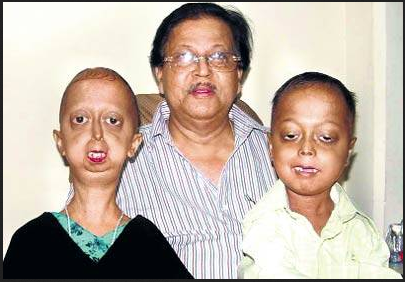 Sanjita, 21, is a gene carrier, but seven-year-old Gulab Shah is normal. Ali Hosain, Rehena and Ikramul. Rehena passed away at 24. In 2003, the villagers ostracised the family from Chhapra. “My children could not come out of the house in the day. They were considered bad omens,” says Bisul, “They were called ghosts and the villagers abused my wife as a witch.” The family lived on the periphery of the village. “They could not wear stitched clothes as they would not fit. They wrapped blankets around their body,” says Razia. The Institute of Child Health (ICH) brought the family to Kolkata to treat Rubena’s pneumonia. Dr Apurba Ghosh, director of the institute, and Dr Chandan Chatterjee from Switzerland identified her disorder by accident. A team led by Dr Chandan Chattopadhyay, aided by S B Devi Charity home and ICH, began studying the children in the University of Basel in Switzerland. They found that the family carried a defective gene called Amino AC. The trust now takes care of the family’s needs, apart from the medical requirements of the children. They have become Chatterjee’s extended family, who has built a pukka house in the village. Regular psychological sessions and medication have helped Ikramul and Ali to live for so long. Regardless of the impending death, they enjoy their lives. They watch movies, love to eat biryani, albeit in small amounts like four-year-olds, and idolise Salman Khan. Upon learning that a movie is being shot on their disease, Ali says, “I have not seen Amitabh Bachchan’s movie, but I want to fight like Salman Khan. He rides bikes so fast. I want to earn a lot of money.” Ikramul’s favourite is Shah Rukh Khan. But the innocence of the childhood is not visible on him. His body is frail and weak. Both brothers cannot sit up or bend their legs due astro-arthiritis. Their teeth, due to small bird-like face, jumble into four pairs instead of two. Their organs have not developed properly and they have child-sized liver and heart. They try to avoid the glare of people, but life is just waiting for death as their children have reached 23. 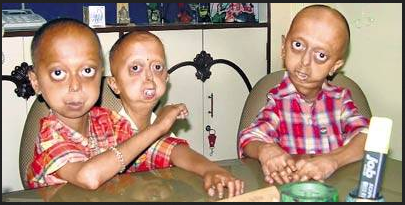 Hardly any child with progeria lives beyond that age.